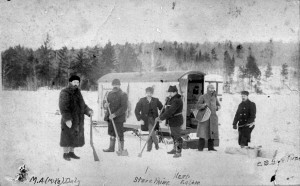 The above photo shows Herbert Eaton ice fishing with friends. We don’t know if it was taken before or after he shot and killed Sam Kelley in 1883. The story of this shooting and that of his brother who survived is told below. On Tuesday March 20, 1883 at about six in the evening Ernest T. Lee was walking along Main St. in Calais when he heard two shots come from a building owned by the Eatons. The Eatons were a prominent Calais family which had acquired its wealth from lumber and shipping in Calais during the boom years of the mid 1800’s. The building contained the offices of the family business, then under the direction brothers Herbert and Joseph Eaton. Unfortunately it seems the Eaton brothers had devoted much of this particular day to drinking, rather than business. Mr. Lee observed Samuel Kelley, a friend of both Herbert and Joseph Eaton, leave the building and head in the direction of his home. Apart from the shots, Ernest Lee noticed nothing out of the ordinary. Had he been more discerning he would have noticed a pronounced gimp in Mr Kelley’s gait, for Mr. Kelley had just been shot in the left hip. The bullet had passed through his body and lodged in his right side. Inside the building Joseph Eaton was attempting to staunch the bleeding from a bullet which had entered his chest, struck a rib and exited from his side. Under ordinary circumstances Joseph could have expected assistance from his brother Herbert. Herbert however had already rushed from the building to the attached barn and was fleeing town in unseemly haste in his wagon. Kelley managed, with great difficulty, to get home and collapsing into his bed, asked for a doctor. Joseph Eaton also went home but failed to inform his wife he had been shot. Only after Kelley and others reported his injuries did he consent to an examination by a doctor. When it became obvious to the authorities that both men had been shot by Herbert Eaton, a warrant was issued for Herbert’s arrest. Thus began a criminal proceedings which established that the quality of justice, even 120 years ago, could depend a great deal on the status and wealth of the defendant. Calais in the 1880’s had twice today’s population. In the decades prior to the 1880’s, Calais had been an important player in international commerce. The main street, from the avenue to the bridge, was a solid front of two and three story structures, housing livery stables, blacksmiths, grocers, ship builders and chandlers, even wig makers. During the 1880’s Calais was a city in transition, economically and socially. The great shipbuilding and lumber boom of the early and mid century was over and the St. Croix Valley was looking to new industries for future economic growth. Cotton mills under construction would result in an economic revival for Calais. However, Calais was still primarily a seaport and its citizens adopted the rhythm and attitudes of a port. An article in the Calais Advertiser in 1881 described Calais as A one vast bee-hive of activity with the mills on both sides of the river humming day and night and all the wharves loading lumber and discharging coal and other merchandise. Because Calais was a seaport, economic and social activity were often dictated not by the clock but by the winds and tides. Ships would sometimes sit becalmed for days in the lower reaches of the river, only to finally arrive in port in the middle of the night. Outgoing ships and their sailors could also wait for days for a fair wind to take them down river. Sailors waiting ashore naturally sought entertainment in bars and houses of ill repute. Not a few locals joined them in these haunts which were open at all hours of the day and night. It is a fair assumption the Eaton brothers and Sam Kelley frequented the local watering holes during the winter of 1883. Drinking in Calais was a serious problem. The Women’s Temperance League and other temperance organizations held endless meetings, adopted reasonable and sober proposals to alleviate the problem but seemed to have almost no impact on the drinking habits of their fellow citizens. The papers carried reports of unknown sailors found floating in the St Croix after a night on the town. Municipal Court was in business, it seemed, almost exclusively to punish the drunk and disorderly. While many such as the League railed vociferously against the evils of drink, the majority seemed to accept intoxication as a human condition neither more nor less censorious than other human frailties. Certainly the public and the Court’s attitudes toward intoxication were to be a major factor in the outcome of the Kelley case. From the outset the authorities dearly wished everyone involved in the shooting had been as stoic as Joseph Eaton. However the shooting of two citizens required some sort of investigation. It is difficult from the news reports to determine how much of the information which became public was a result of the official investigation and how much was provided by the Whig, a local paper which may have felt the police could have been more diligent. In any event both the Calais Times and the Calais Advertiser carried reports in their next editions summarizing the evidence obtained to date. As Calais’ establishment papers, they strongly defended the authorities and Herbert Eaton throughout the affair but the facts even as reported by these papers were extremely damning. According to the articles Samuel Kelley and S.W. Haycock were walking past the Eaton building having just returned on the train from Princeton when they were invited in by Joseph Eaton. After a brief conversation inside the building, Herbert Eaton, Joseph’s brother, picked up a quart of liquor from the floor and threw it at Haycock’s head. Haycock caught the bottle, handed it to Joseph Eaton and wisely headed for the door. At this point Joseph blocked the door with a chair and poured Haycock a tumbler of whiskey which Haycock refused to drink. Haycock again tried to leave but Joseph prevented him. Herbert Eaton then struck the glass, splashing the whiskey in his brother Joseph’s face. Sam Kelley was merely an observer, taking no part in the altercation. After spilling the whiskey, Herbert called the hostler (horse handler), an East Indian, from the adjoining shed. While the hostler was making his way from the grain shed, Mr. Haycock darted out the back door to the barn and hid in a horse stall. He claims he heard no shots but did see Herbert leave hurriedly soon thereafter. When the hostler arrived in the room, he says Herbert drew a gun which he thought Herbert meant to fire to scare him. The hostler retreated and heard Herbert say A Joe, I’ve stood your fooling long enough followed instantaneously by two shots. Sam Kelley confirmed that Herbert shot Joseph and before he could escape Herbert turned his pistol on him and fired. @ Joseph Eaton also made a statement but no details are given in the reports other than to say it was consistent with Kelley and Haycock’s testimony. The most incriminating evidence against Herbert was provided by the hostler but the papers claimed he spoke little English and his testimony was therefore unreliable. Certainly Herbert’s statement before firing showed an intent which was inconsistent with the theory of the case soon to be advocated by the newspapers. A as soon as his condition permitted. At nine that night he presented himself to the authorities in Calais and was immediately granted bail in the amount of $7500, a very substantial amount of money in 1883. Who paid the bail or how they acquired such a prodigious sum so quickly is not known. However Herbert was immediately released and all breathed a sigh of relief as he headed south to his summer residence. The timing of the critical events is difficult to ascertain with complete certainty but it appears that well before Herbert was released on bail Samuel Kelley had very inconsiderately developed peritonitis from the gunshot wound. His grave condition was no secret and the authorities might at least have checked to determine if the victim was likely to live before setting bail on Herbert. Murder, even second degree murder, was a non bailable offense at the time. Herbert’s friends must have known of Kelley’s condition and very wisely convinced Herbert to surrender and make bail before Kelley’s death. The next day, Thursday, Kelley died and a new warrant was issued for murder. The Marshall waited until Friday to proceed to Herbert’s summer residence but Herbert had vanished. No doubt the Marshall was sufficiently dilatory in his march south to the beach to provide time for Herbert’s friends to advise him of the new warrant. Telegraphs to Boston, Bangor and the Canadian Provinces turned up no trace of the fugitive. Many in the public condemned the way the affair had been handled by the authorities. The public’s jaundiced eye saw a good deal of favoritism in holding a bail hearing late at night for a defendant who had shot two people the day before and threatened to shoot the Marshall and his deputies earlier that day. Herbert might at least have been required to cool his heels in a cell until daybreak and a public hearing held when all the facts, including Kelley’s condition, could have been presented to the Court. Some cynics went so far as to complain a A rich man could do murder and go unpunished. The case became a cause celebre in both the United States and Canada. The Calais Times, bristling at the meddling of the distant press said Many newspapers in Maine, in other States and across the line, have made, unwittingly, most libelous charges, for which they are responsible in law. In response to the barrage of criticism the Advertiser and Times went on the offensive. In its next edition of the Advertiser published an article entitled Herbert W. Eaton. It is probably a finer eulogy than any published on his death. Not to be outdone, the Times published an article two days later which defended Herbert as a misunderstood and generous man who having large means inherited as a young man, led a life of ease. Herbert, according to the Advertiser, was really himself a victim of circumstances. Left without a father and with a large sum of money when just a lad he had never being compelled to work and for this reason fell into some rather bad habits. He has been a drinking man but no more so than thousands of others, and less so than some who roundly condemn his drinking. He was no better or worse than many others in every city until this shooting occurred and just what has happened in his case is liable to happen in that of any of the thousands who drink rum year after year. Even so Herbert was, we are assured, without a trace of malice, he was generous and kind. He was not really a violent man, only intemperate, and while both the Advertiser and Times had reported just one week earlier that he had threatened to kill anyone who tried to arrest him, the Advertiser now claimed A he never threatened to shoot or resist an officer. As to his alleged wealth the Advertiser demolishes this myth by claiming Herbert’s summer residence is worth only $2000 and At this house he has kept a stable boy, and part of the time a cook, and never more than two servants. We are left to speculate on the size of the staff at his other homes. Finally the Advertiser confronts the allegations in the press that Herbert was a carouser and rake of the first order who was known in all the low places and frequented the saloons and racecourses. One scurrilous paper even claimed he was a drunken nabob who has led the fashion for a fast set in Calais and the leading spirit of a circle of dissolute young men who strove to imitate his wanton gaiety. Other papers had called him a professional spendthrift, Jesse James and a man mastered by dissolute habits. Absolute lies says the Advertiser. Herbert was a recluse who never had many visitors, but was always a gentlemanly host to those who occasionally called. His most recent visitors, S.W. Haycock, Samuel Kelley and the Marshall might well have disputed this particular claim. The Times found him generous, sensitive and genial when in sober moments and in the long run has used far less liquor than the average habitual drinkers found in every community. Everything he did after the shooting, we are told by the Times, was motivated by a deep sense of remorse and grief over his actions. Both articles energetically defend the mayor, Marshall, judge and anyone else who had a hand in setting Herbert Eaton loose. The papers also inform the public that the crime was not really murder anyway and too much has been made of the entire incident. The Advertiser even implies the shooting occurred while the participants, including Kelley, were involved in a drunken debauch. However as Kelley had only arrived in Calais on the Princeton train twenty minutes before being shot, this claim is unsupportable. In a final plea in Herbert’s defense the Advertiser mentions Herbert’s attempt to shoot himself thereby indicating the keenness of his mental suffering since the fatal act. It is true Herbert suffered self-inflicted gunshot wounds to his head within days of his disappearance. Herbert fled the jurisdiction after hastily signing his property over to others. The Canadian border was nearby and Herbert was over it as soon as Kelley died. He boarded what was known as the Quebec train and tried to put some distance between himself and his misdeeds. He also became intoxicated and, claimed the local papers, in a fit of remorse and grief shot himself five times in the head. First reports said his injuries were not serious but he was in a shattered mental condition. Later dispatches reported the injuries were more serious than originally thought and he might not be able to return home to face justice for quite some time. He needn’t have worried. History was in the process of being rewritten and the final chapter would be wrought not by the lady with the scales but by those with influence and money. After Kelley was buried in the Calais cemetery by his wife and daughter, interest in the case flagged. The Advertiser and Times, and these are the only papers which have been archived, carried no reports for several months. Herbert Eaton had gone to ground and stayed well hidden until October 10, 1883 when he appeared before Justice Danforth in the Washington County Superior Court. In May of 1883, he had been indicted for manslaughter by the Washington County Grand Jury. He had not yet appeared before the Court on the charge of manslaughter and on October 10, 1883 he was arraigned before Justice Danforth. He entered a plea of nolo contendere to the charge of manslaughter. There can be no question a deal had been struck and the outcome made certain before Herbert agreed to present himself to the court. The judge later denied any deal had been made but given the history of the case and the sentence, it would strain even the most gullible mind to believe the case had not been good and truly fixed. During sentencing the judge noted that the grand jury had reduced the charge from murder to manslaughter and could only have done so for reasons other than Herbert’s intoxication. The intoxication of the defendant would have reduced the charge only to second degree murder. Having said this the court discussed the issue of intoxication saying If a man voluntarily puts himself into a condition of forgetfulness when he has no control over his passions he must be responsible for his acts in consequence thereof. One would have thought such sentiments portended doom for Herbert especially when the judge then said if the condition continues so long as to result in disease that raises another question. This above all is a thing from which the public must be protected. Herbert at this point must have been getting a little concerned. One can envision him turning nervously to his attorney, the esteemed A. MacNichol, and whispering I thought we had a deal. Herbert needn’t have worried. The question of how to protect the public from the likes of Herbert is finally answered by the judge but to do so he is forced to resort to a rather remarkable twist of logic. Herbert, says the judge, has been sober since the incident. How the judge or anyone could have known this is a grave question as Herbert had been hiding out for nearly seven months. Nonetheless the judge accepts Herbert’s sobriety as the truth and is determined to reward Herbert’s temperance. I would be sorry to place any discouragement in his way in this regard. Should Herbert go to prison, we are told, he might revert to his evil drinking ways and thereby again become a danger to society. The only way to prevent this and protect society is not to incarcerate Herbert but to fine him $1000 and send him on his way. Such was the sentence of the Court. One does wonder had Samuel Kelley shot Herbert and Joseph Eaton whether Samuel’s friends would have been able to arrange such a result. There is an epilogue to this story. During November of 1883 the Judge was sitting in Skowhegan and found it necessary to defend his handling of the Eaton case . The sentence had obviously created quite a furor throughout the State and Danforth decided, in a conspicuous error in judgment, to give an interview to the Somerset Reporter defending his decision. Most judges have learned the press is not the place to defend an indefensible decision, having dug a very deep hole it makes little sense to pull the walls in on your head. Danforth, however, could not resist the temptation to redeem his judicial honor. Upon reflection he had decided the case was not even manslaughter but, in reality, no crime at all! The shooting was an accident which occurred when Herbert drew his pistol to frighten the hostler and it accidentally discharged not once but twice. The judge does not explain how a person accidentally discharging his pistol twice could manage to hit two people standing at a substantial distance from one another in vital parts of their bodies. This is same man who a few days later took aim at his own head and fired five shots, none fatal. As it was not manslaughter, the judge explained only a fine was warranted and the only reason any fine at all was imposed was because he was drunk at the time of the accident. But for the drunkenness there would have been no crime. It’s unlikely this revision of history did much to quell the public uproar. The Kelley killing cause quite a furor in 1883 and justly so. A dissolute young man from a wealth family killed an innocent man, wounded his own brother, threatened those who came to arrest him and fled the jurisdiction as soon as Kelley died and he realized the seriousness of his situation. Any of these four acts singly would justify some period of incarceration. All four were committed by the same man in a period of 2 days. While the most serious of the charges was probably manslaughter, not murder, a $1000 fine was indefensible. Herbert Eaton did not spent even a day in jail. However someone did go to jail as a result of the Kelley killing. The poor East Indian hostler was arrested and thrown in jail as a material witness, perhaps to reflect on the inadvisability of giving testimony against his betters. This alone tells us much about the social and political climate of the times, when it seems a Arich man could do murder and go unpunished.